This chapter describes the events that occur when the user interacts with a webpage on iOS. Forms and documents generate the typical events in iOS that you might expect on the desktop. Gestures handled by Safari on iOS emulate mouse events. In addition, you can register for iOS-specific multi-touch and gesture events directly. Orientation events are another example of an iOS-specific event. Also, be aware that there are some unsupported events such as cut, copy, and paste. A clickable element is a link, form element, image map area, or any other element with mousemove, mousedown, mouseup, or onclick handlers. A scrollable element is any element with appropriate overflow style, text areas, and scrollable iframe elements. Because of these differences, you might need to change some of your elements to clickable elements, as described in “Making Elements Clickable,” to get the desired behavior in iOS. In addition, you can turn off the default Safari on iOS behavior as described in “Preventing Default Behavior” and handle your own multi-touch and gesture events directly. Handling multi-touch and gesture events directly gives developers the ability to implement unique touch-screen interfaces similar to native applications. Read “Handling Multi-Touch Events” and “Handling Gesture Events” to learn more about DOM touch events. See “Supported Events” for a complete list of events supported in iOS. On iOS, emulated mouse events are sent so quickly that the down or active pseudo state of buttons may never occur. Read “Highlighting Elements” for how to customize a button to behave similar to the desktop. It’s very common to combine DOM touch events with CSS visual effects. Read Safari CSS Visual Effects Guide to learn more about CSS visual effects. This section uses flow charts to break down gestures into the individual actions that might generate events. Some of the events generated on iOS are conditional—the events generated depend on what the user is tapping or touching and whether they are using one or two fingers. Some gestures don’t generate any events on iOS. One-finger panning doesn’t generate any events until the user stops panning—an onscroll event is generated when the page stops moving and redraws—as shown in Figure 6-1. Displaying the information bubble doesn’t generate any events as shown in Figure 6-2. However, if the user touches and holds an image, the image save sheet appears instead of an information bubble. iOS Note: The image save sheet appears on iOS 2.0 and later. Finally, a double tap doesn’t generate any events either as shown in Figure 6-3. Mouse events are delivered in the same order you’d expect in other web browsers illustrated in Figure 6-4. If the user taps a nonclickable element, no events are generated. 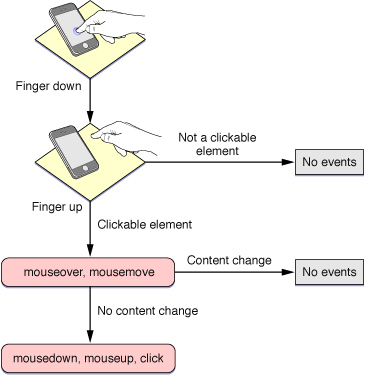 If the user taps a clickable element, events arrive in this order: mouseover, mousemove, mousedown, mouseup, and click. The mouseout event occurs only if the user taps on another clickable item. Also, if the contents of the page changes on the mousemove event, no subsequent events in the sequence are sent. This behavior allows the user to tap in the new content. The pinch open gesture does not generate any mouse events as shown in Figure 6-5. 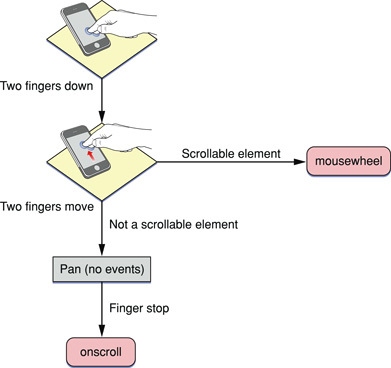 If the user holds two fingers down on a scrollable element and moves the fingers, mousewheel events are generated. If the element is not scrollable, Safari on iOS pans the webpage. No events are generated while panning. An onscroll event is generated when the user stops panning. Typical events generated by forms and documents include blur, focus, load, unload, reset, submit, change and abort. See “Supported Events” for a complete list of supported events on iOS. Because of the way Safari on iOS creates events to emulate a mouse, some of your elements may not behave as expected on iOS. In particular, some menus that only use mousemove handlers, as in Listing 6-1, need to be changed because iOS doesn’t recognize them as clickable elements. To fix this, add a dummy onclick handler, onclick = "void(0)", so that Safari on iOS recognizes the span element as a clickable element, as shown in Listing 6-2. If you register for multi-touch events, the system continually sends TouchEvent objects to those DOM elements as fingers touch and move across a surface. These are sent in addition to the emulated mouse events unless you prevent this default behavior as described in “Preventing Default Behavior.” A touch event provides a snapshot of all touches during a multi-touch sequence, most importantly the touches that are new or have changed for a particular target. The different types of multi-touch events are described in TouchEvent in Safari DOM Additions Reference. A multi-touch sequence begins when a finger first touches the surface. Other fingers may subsequently touch the surface, and all fingers may move across the surface. The sequence ends when the last of these fingers is lifted from the surface. 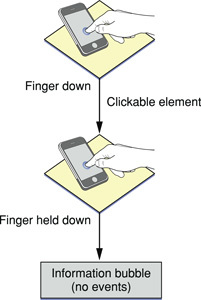 An application receives touch event objects during each phase of any touch. Touch events are similar to mouse events except that you can have simultaneous touches on the screen at different locations. A touch event object is used to encapsulate all the touches that are currently on the screen. Each finger is represented by a touch object. The typical properties that you find in a mouse event are in the touch object, not the touch event object. Note that a sequence of touch events is delivered to the element that received the original touchstart event regardless of the current location of the touches. Follow these steps to use multi-touch events in your web application. Note that you can get all other touches for an event even when the event is triggered by a single touch. Begin gesture if you receive a touchstart event containing two target touches. End gesture if you receive a touchend event with no preceding touchmove events. Begin gesture if you receive a touchstart event containing one target touch. Abort gesture if, at any time, you receive an event with >1 touches. Continue gesture if you receive a touchmove event mostly in the x-direction. Abort gesture if you receive a touchmove event mostly the y-direction. End gesture if you receive a touchend event. Multi-touch events can be combined together to form high-level gesture events. GestureEvent objects are also sent during a multi-touch sequence. Gesture events contain scaling and rotation information allowing gestures to be combined, if supported by the platform. If not supported, one gesture ends before another starts. Listen for GestureEvent objects if you want to respond to gestures only, not process the low-level TouchEvent objects. The different types of gesture events are described in GestureEvent in Safari DOM Additions Reference. Follow these steps to use gesture events in your web application. The angle is in degrees, where clockwise is positive and counterclockwise is negative. The scale is smaller if less than 1.0 and larger if greater than 1.0.
iOS Note: The preventDefault method applies to multi-touch and gesture input in iOS 2.0 and later. The default behavior of Safari on iOS can interfere with your application’s custom multi-touch and gesture input. You can disable the default browser behavior by sending the preventDefault message to the event object. Important: The default browser behavior may change in future releases. An event is sent when the user changes the orientation of iOS. By handling this event in your web content, you can determine the current orientation of the device and make layout changes accordingly. For example, display a simple textual list in portrait orientation and add a column of icons in landscape orientation. In addition, the window object has an orientation property set to either 0, -90, 90, or 180. For example, if the user starts with the iPhone in portrait orientation and then changes to landscape orientation by turning the iPhone to the right, the window’s orientation property is set to -90. If the user instead changes to landscape by turning the iPhone to the left, the window’s orientation property is set to 90. <!--DOCTYPE html PUBLIC "-//W3C//DTD XHTML 1.0 Strict//EN"
Be aware of all the events that iOS supports and under what conditions they are generated. Table 6-1 specifies which events are generated by Safari on iOS and which are generated conditionally depending on the type of element selected. This table also lists unsupported events. iOS Note: Although drag and drop are not supported, you can produce the same effect using touch events as described in “Using Touch to Drag Elements” in Safari CSS Visual Effects Guide.The unload event may not work as expected for back and forward optimization. Use the pageshow and pagehide events instead. abort Yes No iOS 1.0 and later. blur Yes No iOS 1.0 and later. change Yes No iOS 1.0 and later. click Yes Yes iOS 1.0 and later. focus Yes No iOS 1.0 and later. gesturestart Yes N/A iOS 2.0 and later. gesturechange Yes N/A iOS 2.0 and later. gestureend Yes N/A iOS 2.0 and later. load Yes No iOS 1.0 and later. mousemove Yes Yes iOS 1.0 and later. mousedown Yes Yes iOS 1.0 and later. mouseup Yes Yes iOS 1.0 and later. mouseover Yes Yes iOS 1.0 and later. mouseout Yes Yes iOS 1.0 and later. orientationchange Yes N/A iOS 1.1.1 and later. pagehide Yes No iOS 4.0 and later. pageshow Yes No iOS 4.0 and later. reset Yes No iOS 1.0 and later. submit Yes No iOS 1.0 and later. touchcancel Yes N/A iOS 2.0 and later. touchend Yes N/A iOS 2.0 and later. touchmove Yes N/A iOS 2.0 and later. touchstart Yes N/A iOS 2.0 and later. unload Yes No iOS 1.0 and later.